Leaf: many, dense-rosetted, generally 2--10 cm, thread-like to narrowly lanceolate, entire, generally persistent after withering, tapered to fleshy, expanded base, tip obtuse. Inflorescence: stems many, 1--3.5 cm, (1)2-flowered; flowers +- exserted or not from leaves; bracts in 1--2 irregular pairs, above stem middle, +- ovate, marginal teeth with +- red or dark glands; pedicel 2--5 mm. Flower: sepals 2, +- 1/2 × corolla, +- rounded or truncate, marginal teeth with +- red or dark glands; petals 6--8, +- 8 mm, obovate, white, pink, or +- red, tip irregular, generally acuminate; stamens 6; stigmas 4. Fruit: 4--15 mm. Seed: <= 24, 1--2 mm. 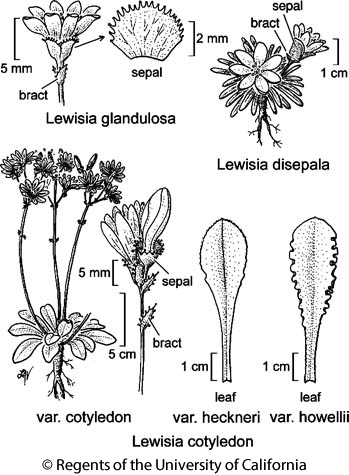 Citation for this treatment: John M. Miller & Lauramay T. Dempster 2012, Lewisia glandulosa, in Jepson Flora Project (eds.) Jepson eFlora, http://ucjeps.berkeley.edu/eflora/eflora_display.php?tid=30839, accessed on April 23, 2019.